It continuously monitors upstream and downstream pipeline pressure dynamics to provide early detection of pipeline breaks and initiate automatic valve actuator movement to a pre-selected emergency position. The ELB is housed in a compact, environmentally sealed and explosionproof housing that can be mounted on the actuator or remotely. 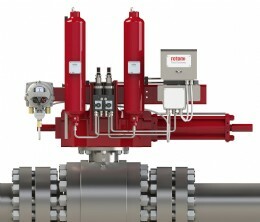 Valve actuator control - selectable as fail close, fail open or stay put - is based on Rate-of-Drop (RoD) and Rate-of-Rise (RoR) of the pipeline pressure as well as high and low pressure limits. A remote Process Shut Down (PSD) input with the option to override all functions is also available to drive the valve to the predetermined fail position. The ELB also provides an array of programmable alarm and alert indications and has an extensive range of features that can be configured to meet end users� specific requirements. These include up to six remote inputs and four configurable solenoid outputs, Partial Stroke Testing (PST) and Modbus� network connectivity.